Campeggio Le Coin Tranquille si trova a Les Abrets, Isère. Questo campeggio dispone di piazzole delimitate, sia ombreggiate che, senza ombra e piazzole poco ombreggiate. È possibile affittare casemobili e bungalow. Il campeggio dispone di un parco giochi e di un campo sportivo. Per gli sportivi, il campeggio prevede diversi percorsi in bicicletta. Ci sono un programma di animazione. Il campeggio dispone di una piscina scoperta, una piscina coperta con copertura scorrevole e una vasca per i più piccoli. Non è sempre necessario cucinare, perché all’interno del campeggio ci sono snackbar, pizzeria, ristorante con menù poche portate e ristorante con ampio menù presente. In campeggio è possibile acquistare pane fresco. Potete navigare su Internet, poiché c'è un punto wi-fi. Ogni anno un ispettore visita il Campeggio Le Coin Tranquille, controllando oltre 200 tra attrezzature e altri punti di interesse del campeggio. L'ispettore è un dipendente ACSI e non lavora per il campeggio. Lovely well kept site. Good facilities. Peaceful. Very friendly and helpful staff. Family owned. Perfect place to chill out. As it was late in the season we didn’t have the use of the pizzeria etc. The shops stock was low as it was nearing the end of the season but we could get fresh bread. Great place for a few days rest. Well 5 actually. Friendly staff and welcome. Pitches vary in size with both shaded and sunny locations. Plenty of water points. 10 amp power tends to trip easily. New swimming pools just completed. Weekly \\\'get together\\\' meals and entertainment good fun. Small shop for daily bread and basic requirements. Restaurant with a good selection. Wonderful Sundae desserts. Also take-away with good selection of pizza. Toilet blocks typical size for France. Site clean. Overall a good site. Would recommend. Wonderful site run by wonderful people!! We will definitely return. We were so lucky to have chosen this campsite. As a result we had a wonderful week despite the bad weather for some of the time. Well worth a visit. A super camp site...very friendly and helpful staff, large pitches and immaculate facilities in a lovely part of France. The restaurant is very good and they have a "party" night once a week during the busy season which is a good fun if you enjoy mixing with the other campers. Very reasonably priced with the ACSI discount. This family owned campsite is superb, one if the best we've ever stayed at. All facilities are good, it's beautifully situated and very well maintained and the staff can't do enough for you. Excellent restaurant on site (even locals use it) with spacious bar. Great pool. Can't fault it apart from narrow access roads but they're easily navigable. Ideal place to explore the Vercor from. This remains one of my favourite campsites. From the minute you enter the flower filled check in area to the excellent reception welcome, you know you are in for a treat. The pitches are level, almost all shaded and hedged. The facilities are spotless and kept so. The on site restaurant is excellent. If you have the opportunity join one of the pre set dinners. WE had the fortune to be at the moules et frittes evening with unlimited food, as much wine as you could consume and great entertainment. This is one very special place. This is a really good campsite in a lovely area. The family who run it are most friendly and helpful. The pitches are very large. The sanitaires are very clean with plenty of showers and toilets. The pool is good. There is a very good pizzeria/ restaurant on site. It is ideal for visiting Chambery, Grenoble and the whole area is spectacular. Highly recommended. Volete prenotare il campeggio Campeggio Le Coin Tranquille o oppure saperne di più? Potete farlo usando i seguenti dati oppure tramite il sito del campeggio. A43 Lyon-Chambéry, uscita 10 Les Abrets. Alla rotonda a sinistra verso il centro, poi verso Pont-de-Beauvoisin (N6). Dopo 1,5 km il camping è segnalato a sinistra. Superare i binari e proseguire per 1 km. 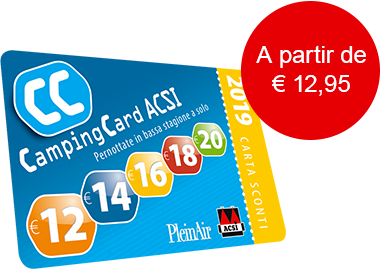 ACSI Eurocampings invia la tua richiesta di informazioni al "Campeggio Le Coin Tranquille".